These are the After Coffee mints sold at the counter at Starbucks. There are 160 of these tiny mints in the metal container. The mint is quite powerful, and sure to eliminate that post-coffee breath we all know and love. While not an actual coffee product review, it is coffee related. We recommend this over the gum because there are so powerful, and at 150 in a container you’ll have mints for a long time. 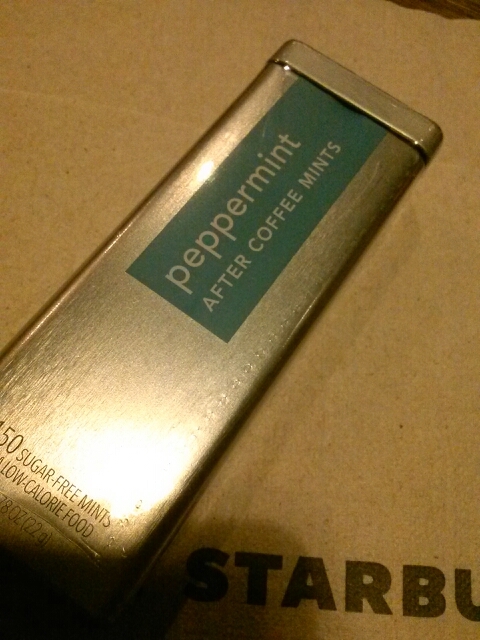 First impression: REALLY strong mint scent and taste when you first open the package and eat the first mint. After a few weeks: The mint scent and ‘power’ seems to fade at this point. The mints are not ‘candy coated’ to seal in the mint power, so your mileage will vary. The package could last you a whole month, provided you eat about 5 mints a day. That’s quite a mint addiction you got there.